Discover and learn about the Bible in a whole new way with The Action Bible Guess-It Game! 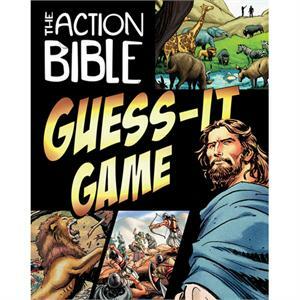 Designed for ages 8 years and older, this game can be played with 2 or more players and tests and expands your Bible knowledge. Includes 100 oversized, laminated cards with 20 questions on each card that point toward the answer (a person, place, or thing from the Bible) and feature artwork taken from The Action Bible.